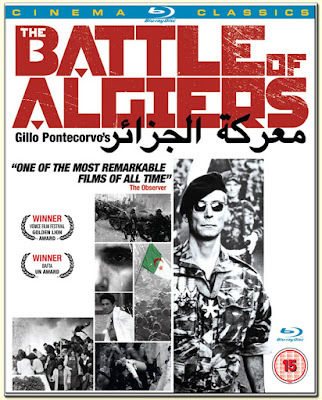 The Battle of Algiers (Italian: La battaglia di Algeri; Arabic: معركة الجزائر‎; French: La Bataille d'Alger) is a 1966 war film based on occurrences during the Algerian War (1954–62) against the French government in North Africa, the most prominent being the titular Battle of Algiers. An Italo-Algerian production, it was directed by Gillo Pontecorvo and shot on location. The film, which was shot in a Rossellini-inspired newsreel style—in black and white with documentary-type editing—is often associated with Italian neorealism cinema. Algeria gained independence from the French, a matter which Pontecorvo portrays in the film's epilogue. The film concentrates on the years between 1954 and 1957 when the guerrilla fighters regrouped and expanded into the Casbah, which was met by French paratroopers attempting to regain territory. The highly dramatic film is about the organization of a guerrilla movement and the methods used by the colonial power to contain it. A subject of socio-political controversy, the film wasn't screened for five years in France, where it was later released in 1971. The Battle of Algiers reconstructs the events that occurred in the capital city of French Algeria between November 1954 and December 1957, during the Algerian War of Independence. The narrative begins with the organization of revolutionary cells in the Casbah. Then partisan warfare between Muslims and Pied-Noir in which both sides exchange acts of increasing violence leads to the introduction of French army paratroopers to hunt the National Liberation Front (FLN). The paratroopers are depicted as winning the battle by neutralizing the whole of the FLN leadership through either assassination or capture. However, the film ends with a coda depicting nationalist demonstrations and riots, suggesting that although France won the Battle of Algiers, it lost the Algerian War. The tactics of the FLN guerrilla insurgency and the French counter insurgency, and the uglier incidents of the war, are depicted. Colonizer and colonized commit atrocities against civilians. The FLN commandeer the Casbah via summary execution of Algerian criminals and suspected French collaborators and use terrorism, including bombings, to harass Europeans. The security forces resort to lynch mobs and indiscriminate violence against the opposition. French paratroops are depicted as routinely using torture, intimidation, and murder. Pontecorvo and Solinas have several protagonists, based on historical war figures. The story begins and ends from the perspective of Ali la Pointe (Brahim Haggiag), a petty criminal who is politically radicalized while in prison and then recruited by FLN commander El-hadi Jafar (Saadi Yacef, dramatizing a character based on himself). Lieutenant-Colonel Mathieu, the paratroop commander, is the principal French character. Other characters are the boy Petit Omar, a street urchin who is an FLN messenger; Larbi Ben M'hidi, a top FLN leader and the film's political rationale for the insurgency; and Djamila, Zohra, and Hassiba, three FLN women urban guerrillas who effect a terrorist attack. The Battle of Algiers also features thousands of Algerian extras; Pontecorvo's intended effect was the "Casbah-as-chorus", communicating with chanting, wailing, and physical effect.